BlytheLife.com » Get involved & be heard! I often get emails asking how you can be involved with BlytheLife.com! I’m always happy to answer questions like that, and since there’s so many ways, I thought I would share them all in a post so you can learn about all the ways that you can contribute, and how BlytheLife can work for you. Comment! On occasion, I do fun, random giveaways that are open to past commenters winning a little something just for sharing their views on posts here on BlytheLife. Contribute an article or a tutorial or a post of some kind! 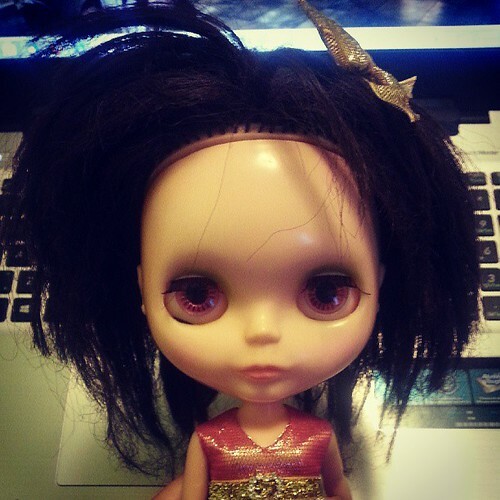 Share your first doll story, or your special rerooting secret! Do you have a shop? Are you having some kind of special sale? Let readers of BlytheLife know via Shopping Saturday. Offer a suggestion of a post or a review that you’d like to see me write. There’s a little-known feature known as Blog Blurb Wednesday where you can share your (doll-related) blog here on BlytheLife. If you want a bigger audience for your website or shop, look no further than sponsoring BlytheLife. Funds help pay for the costs associated with keeping this website up and I appreciate everyone who’s ever advertised here. Every post on BlytheLife has a little Twitter icon! If you liked the post that you just finished reading (like this one!) and want to share it others, you can by clicking on the button and approving it to show up on your Twitter feed! And if you have any recommendations for new features that you think others would love to see on BlytheLife, let me know about it and maybe it could become a little something here! I like getting recommendations that can become posts here and I appreciate the kind words of encouragement that I’ve received from readers. So what are you waiting for? Get involved and be heard! I will try write an article to BlytheLife ^^ maybe something about favorites clothes, what do you think?